What Can A Chiropractor Help? Help, I am so sore! There are many factors that play a role in muscle soreness and cramps. It can be tricky to put a finger on exactly what causes your muscle cramps, but there are some general rules you can follow to keep yourself injury and pain free through the cold winter months. Luckily, most soreness is gone after a day or two, but here are some tips to avoid muscle cramps and how to treat them when they inevitable show up. I’m sure we all remember a time when our dance teacher came up with a brilliant routine involving what seemed like 50 grand pliés. We loved it at the time, but a day and a half later the soreness set in. Everything hurt, even breathing! This happens to the best of athletes sometimes. Doing the same movement over and over makes the muscles that do that move will get tired and overworked causing damage and tiny tears. The easiest way to explain this is that your muscle experiences several very small injuries or strains. When a muscle is hurting like this and you try to use it, it can cramp up in protest. Movements are grouped into three different categories: static (holding still), concentric (going against gravity, like jumping) and eccentric (going toward gravity, like slowly lowering your leg). Science has proven that eccentric movements make you more sore. The movements that move toward gravity are the ones that are under conditioned and get tired more easily to create soreness. What does this mean in dance terms? 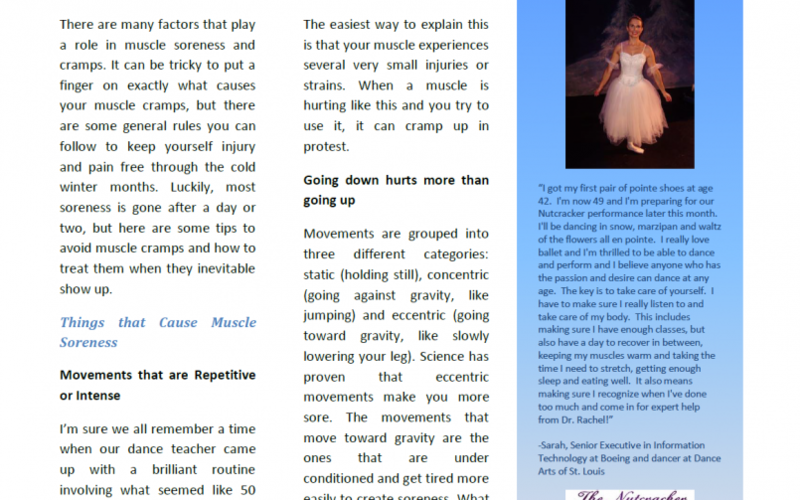 The going down part of grand plié, lowering your leg from a battement, or transitioning from a standing position to on the floor are more likely to make you sore. When we jump we think more about going up than coming down. Drinking plenty of water can keep electrolytes balanced to allow proper contraction and relaxation of muscles. Eating a diet high in protein, healthy carbohydrates, and colorful fruits and vegetables is also a good way to combat muscle soreness because the vitamins and minerals are required to get full contraction and relaxation of muscles and help the body to repair itself. I’m sore today. What can I do? A good rule to follow is to take your weight divided by two and drink that many ounces of water per day. For example, a person weighing 120 lbs. should drink about 60 oz. of water or around 8 cups per day. What can I do to prevent muscle cramps? Extreme stiffness and cramping can be part of a serious medical condition, seek care from a health care professional if you have prolonged symptoms. Copyright © 2018 Clayton Chiropractic Center St Louis, MO. All rights reserved.